The story that we would like to share with you today is a visual one, and one that we would like you to smell, touch, hear and feel. We are in the Piazza del Duomo, in the city center of Milano. Here, twice a year the area transforms into an open runway because models, journalists, designers and creative people are everywhere in the city, moving from one show to the other for Milano Fashion Week. It’s messy, but it’s the manifestation of why fashion is so powerful and strongly connected to our daily life. In these days, beauty, as well as inspiration, is everywhere in the streets. Our story is settled here, mostly in this turmoil of trends, colors, shapes and creative possibilities that parade in the streets of Milano. But our story starts kilometers away from this in a very different place. It all starts in the deep ocean where very little light arrives, and all is silent. Fishes are swimming around trying to avoid big fishing nets where there are already some dead fish trapped that are becoming food for others. Nature doesn’t waste anything, but we do. 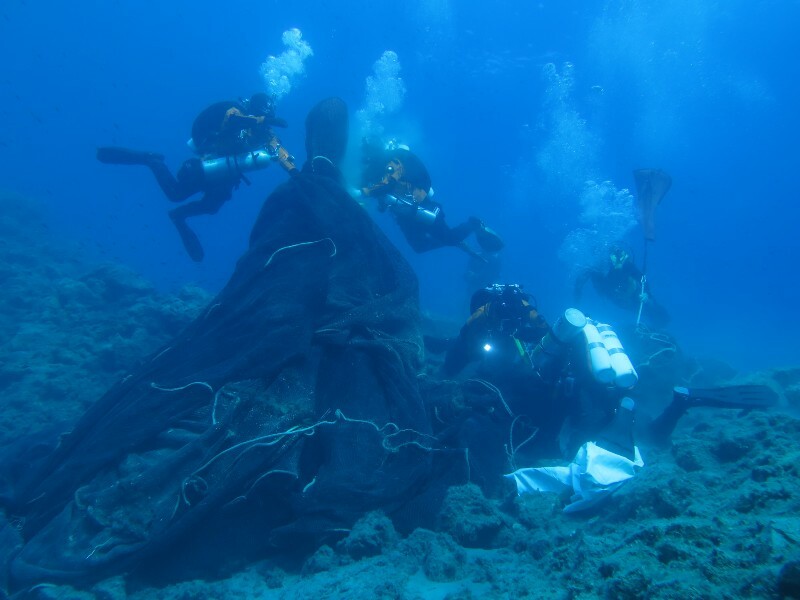 Divers of Ghost Fishing recovering fishing nets for the Healthy Seas initiative. They are then sent to Aquafil to be regenerated into ECONYL® nylon for new textiles. The fishing nets lying on the bottom of this ocean were lost during a storm many years ago and numerous marine animals have already lost their lives or have been injured because of them. But this is coming to an end. Some divers are working hard raising a lot of sand and being careful not to get stuck in the fishing nets they are recovering. Once the fishing nets are free from the vegetation and the shipwreck that is trapping them, they are attached to balloons filled with air that help bring them to the surface where they are collected on a boat. FAO and UNEP estimate that there are around 640,000 tons of lost or discarded fishing gear in the oceans. Meanwhile, again far away in another place that looks like a big city, workers from a furnishing company are substituting the carpet of a building with a new one. Tons of old carpets pile up in big rolls destined for landfills. Each year about 1.6 million tons of used carpets like these are disposed of in Europe and almost 2 million tons in the States (4 billion pounds). And here is where the story of both the fishing nets recovered from the sea and the carpets piling up changes forever. 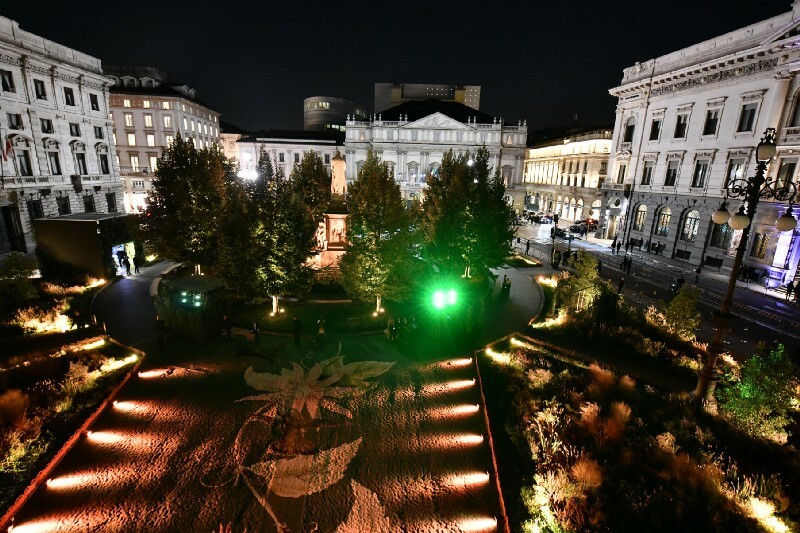 Instead of going into landfills or being incinerated, they will become the source of beauty for multiple events in the Piazza della Scala in Milano during Fashion Week. It’s called regeneration, and it’s a magic process that transforms waste like fishing nets and old carpets into new nylon yarn again for carpets and for apparel. Easy, right? So instead of using fossil raw material to make new yarn, we take nylon waste and give it a new life — and maybe not just one but an infinite number of new lives. This yarn called ECONYL® is indeed 100% regenerated from waste and is also regenerable an infinite number of times. So, this is how a fishing net or an old carpet that is regenerated ended up at Milano Fashion Week this year. Many items made with the ECONYL® yarn were present in Milano on those days. An amazing red green carpet for the Green Carpet Fashion Awards, hosted by Camera Moda in collaboration with Eco-Age. It was printed with images of beautiful hummingbirds and flowers, a design created by Vogue’s editor Hamish Bowles. 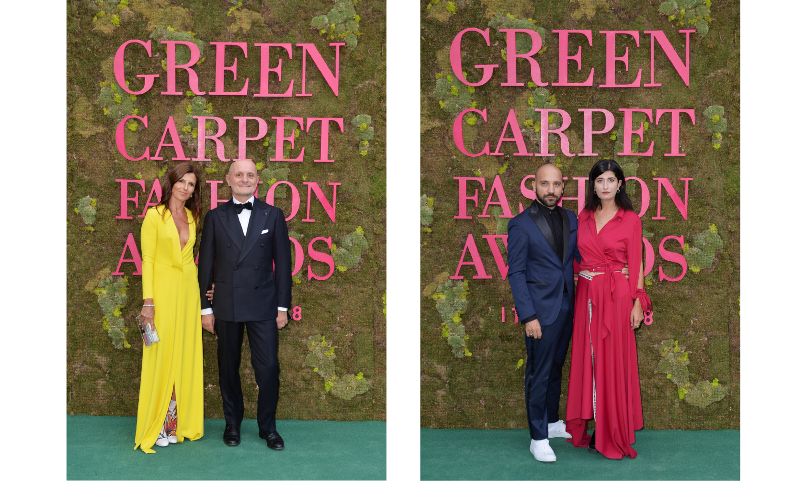 The green red carpet made with ECONYL® regenerated nylon by ege carpets and used at the Green Carpet Fashion Awards hosted by Camera Moda in collaboration with Eco-Age. 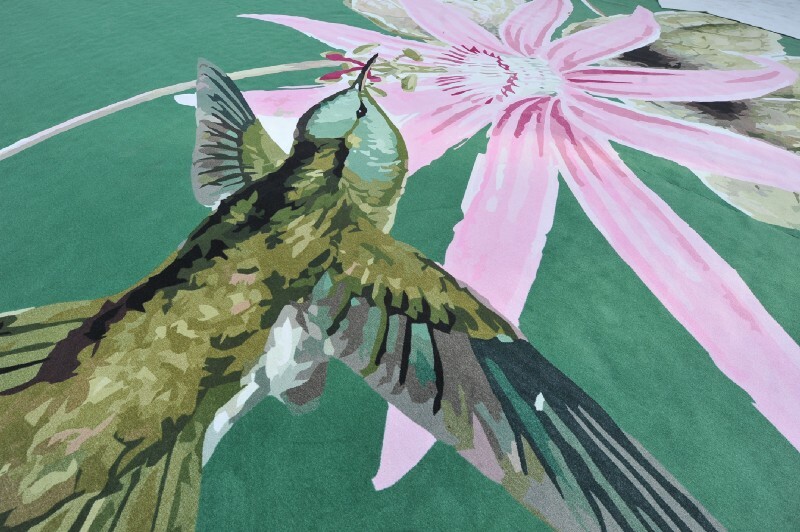 A detail of the design of the carpet created by Vogue’s editor Hamish Bowles. 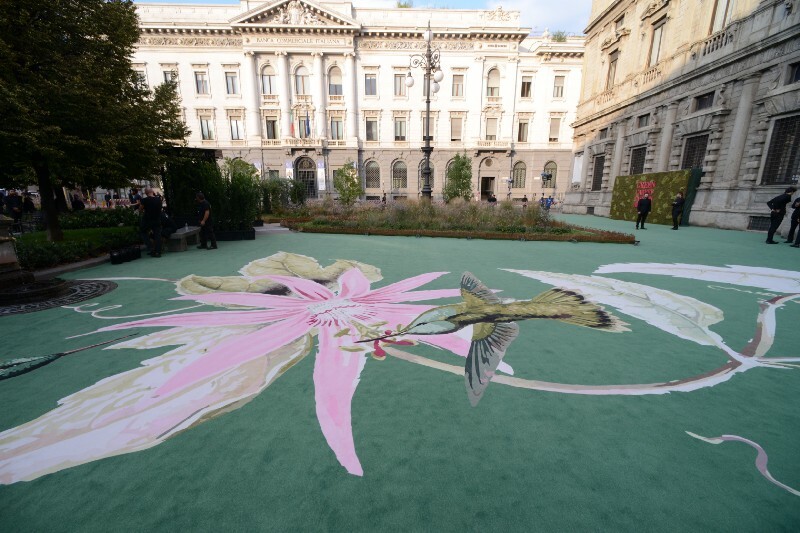 Piazza della Scala during the 2018 Green Carpet Fashion Awards — hosted by Camera Moda in collaboration with Eco-Age – with the carpet made with ECONYL® regenerated nylon. The carpet was produced by ege carpets using our ECONYL® regenerated nylon. It will be reused when possible and regenerated once it’s no longer usable, just like the red carpet of last year’s Green Carpet Fashion Awards. Last year’s carpet, printed with a design of pomegranates and leaves, was also made by ege carpets with our yarn and was regenerated in our facility to become new yarn, possibly also for this year carpet or other fashion items of our customers. Amazing to see the infinite possibilities of what some consider just waste, right? But this is not the whole story because in Milano, just few days before, ECONYL® yarn was one of the sustainable ingredients for beautiful clothes at the runway of Italian designer Tiziano Guardini. 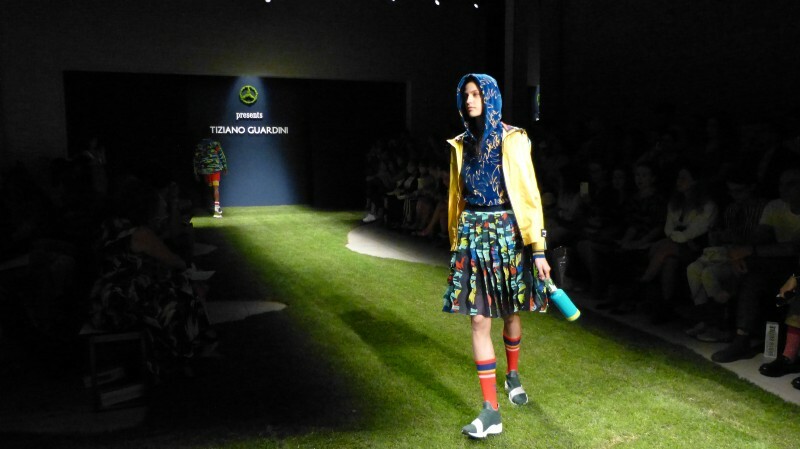 Runway of Tiziano Guardini at 2018 Milan Fashion Week. Outfil made also with ECONYL® yarn. The brand’s Spring/Summer 2019 collection was centered on a relaxed and effortlessly chic wardrobe for dynamic and creative men and women and inspired by an energetic, summery mood infused with references to the beaches of South California. The collection was produced in collaboration with ISKO Denim, Fulfar and Lampa and is crafted from a selection of high-end, innovative materials including ECONYL® nylon for camouflage parkas and windbreakers and Filmar’s certified organic cotton for sweaters and sweatshirts. Guardini presented a selection of slightly oversized silhouettes in a vibrant kaleidoscopic color palette of neon yellow, China blue, pink and green — all of which contributed to the joyful and carefree attitude of the collection. But again, this was not all. Another brand chose our regenerated nylon as the ingredient for two beautiful outfits seen on the red carpet at the Green Carpet Fashion Awards. The two women’s dress created by A-LAB MILANO using ECONYL® regenerated nylon. On the left: Mr. and Ms. Bonazzi and on the right Alessandro Biasi, creative director of A-LAB MILANO with Valentina Siragusa. The brand is called A-LAB MILANO and is positioned in a new, made-in-Italy modernity, through digital patterns design, updated graphic language study and sculpted forms of fabrics. The dresses have been designed by the creative director Alessandro Biasi for Italian web influencer Valentina Siragusa and for the wife of Aquafil’s President and creator of the ECONYL® Regeneration System, Giulio Bonazzi. The ECONYL® yarn will be the ingredient also of the upcoming collection by A-LAB MILANO. This is the beauty of circular economy. Everything needs to be redesigned for circularity, and everything can become something else in the flowing of materials. This is why a circular economy is such an open world for creativity and is also why we are inviting designers and creative peoples to let their imagination go and discover the infinite possibilities of a material — our ECONYL® regenerated nylon — that is endless. At the moment, fashion is the second most polluting industry in the world and is employing one in six people worldwide. The opportunity to have a big and positive impact is huge and could be the solution to transform the low percentage of fashion apparel that is currently recycled into a much more meaningful number, bringing back precious materials to the economy. Without fundamental redesign and innovation, about 87% of fashion items and 99% of carpets will never be recycled. And this is an enormous waste of materials, creative energy and money. The next step which will also need great collective efforts along the supply chains of carpets and fashion will also require technological innovation and the collaboration of designers to create products that are regenerable at the end of their lives and that, when made with many ingredients, can be separated into their components and recycled accordingly. Currently, this is possible with some carpets, and we have two dedicated plants in the States, each able to recycle 36 million pounds of material per year. But the same is much more difficult to apply to the apparel sector where fibers are blended together to the point that is almost impossible to separate them. Like all companies along this path, we don’t have all the solutions, and we still don’t know how to solve some problems. However, we know clearly what is circular and what is linear in our economy, and we know that only a circular economy can assure a future to our business and our world. So, the direction is clear; we just need to collect creative forces and address them towards a circular system.